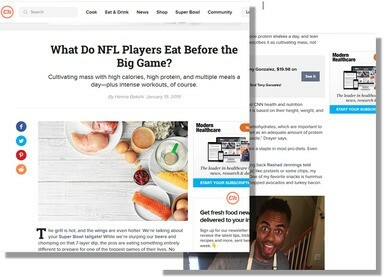 Lisa Drayer > Lisa’s Beauty Bites® > Press > Chowhund.com: What Do NFL Players Eat Before the Big Game? Chowhund.com: What Do NFL Players Eat Before the Big Game? The grill is hot, and the wings are even hotter. We’re talking about your Super Bowl tailgate! While we’re slurping our beers and chomping on that 7-layer dip, the pros are eating something entirely different to prepare for one of the biggest games of their lives. No pressure. So, what does an NFL player eat behind-the-scenes?